Brandon Bannerman (Catsy) isn’t taking it easy during the holiday season, pumping out new builds every few days. 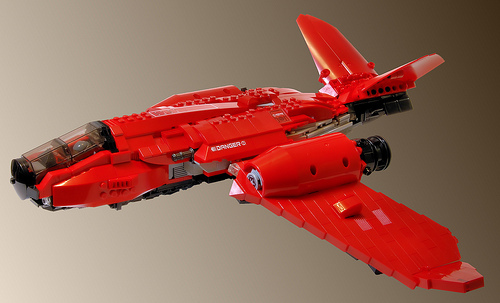 My favorite of the season is this festive red dive-bomber, the sub-orbital B-9D Garuda. Don’t miss the full photoset on Flickr for the escape pod, bomb bays, payload, survival kit, and other lovely details.